Trouble Shot Myths – How to REALLY escape from trouble! You’ve hit a tee shot and the ball comes to lay stymied behind a tree blocking your approach shot to the green. You could give yourself a legitimate chance at making par by cutting the ball around the tree to the front edge of the green. Old school knowledge (Photo #1) will tell you to line your clubface at the tree and feet left of the tree, using where you align your feet dictating the starting direction of the ball. Then to swing along your foot line resulting in a shot which will start along your foot line and curve the desired direction ending where you initially aimed your club at address. New school knowledge, and what I am now teaching, has shown that to be an extremely inefficient way to approach this scenario. When approaching a shot like this, it is important to understand first and foremost that where you align your feet is almost NEVER the line on which the ball is going to start on. Secondly, understand that the greater the difference is between how square your clubface is to the target line at impact and how OUT TO IN the path is which you’re swinging the club, the more the starting direction of the ball will be pushed to the right off the clubface and the more the ball will curve. This happens because the more OUT TO IN the path of your club becomes with a square clubface, the farther to the right the ball starts from your original foot line. If your clubface is square to the target line at impact and your feet are aligned, let’s say 20 yards left of the target presumably creating a swing path which is OUT TO IN, the ball will start closer to half the amount left of your foot line or starting point. Keeping this in perspective, next time you’re stymied behind a tree, try this. (Photo #2). 1) Aim the clubface 5-10 feet left of the tree. You do this because if you aimed the clubface at the tree and foot line 5-10 feet left of the tree, and swung along a slightly open foot line, the ball will inevitably start right of your foot line and fly directly into the tree. 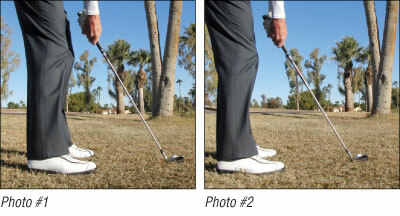 2) Align your feet slightly open to your target line and concentrate on trying to swing the club OUT TO IN or on your foot line. 3) The ball will start roughly half the amount between your foot line and where your clubface is aligned at address given the face is square and ball hit center at impact. 4) By aligning your target slightly left of the tree and feet open to that, you insure that by swinging along your foot line, and keeping a face square to that target line, you never hit the tree and give yourself the best opportunity for a par after a wayward tee shot. To learn more on trouble shots, visit Scott’s website at www.scottsackett.com/tipsanddrills. Scott Sackett, GOLF Magazine Top 100 Teacher since 1999, just voted as one of Golf Digest’s Best Teacher in the State for the fifth year in a row. Also, Director of Instruction at Park Meadows CC in Park City, Utah and while in Scottsdale teaches at McCormick Ranch Golf Club.